This vegetarian quiche is not just for breakfast anymore. Easy to make and delicious to eat! Definitely a dish to add to your list of favorites. Preheat oven to 350 degrees. Line 9-inch pie plate with crust. Melt butter in a skillet. Add onions, garlic, and broccoli. Cook slowly, stirring occasionally until the broccoli is soft. 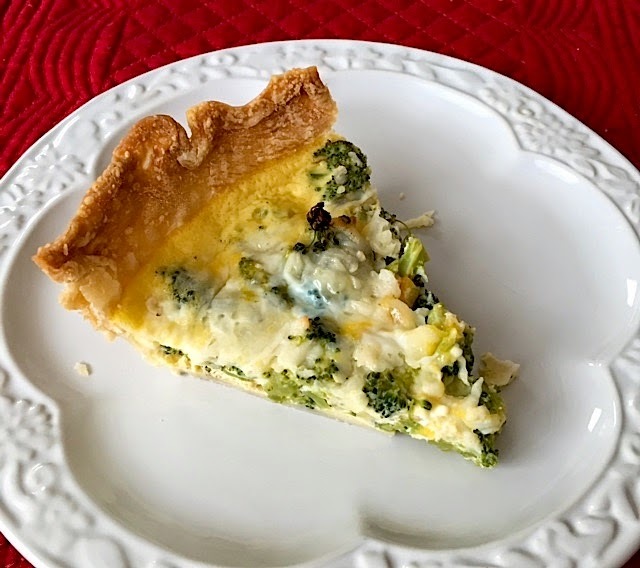 Spoon broccoli into pie plate and sprinkle with the cheese. Combine eggs and milk. Season with salt and pepper and other seasonings if desired. Pour egg mixture over broccoli and cheese. Bake in preheated oven for 30 to 40 minutes or until center has set. If you'd like a printer-friendly version of this recipe, Click Here. *Note: In this recipe, I used summer squash and broccoli. Feel free to use any of your favorite vegetables.